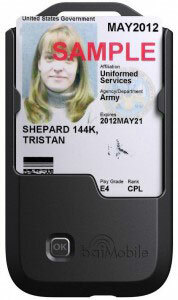 Biometric Associates, LP has announced that the baiMobile 3000MP Bluetooth Smart Card Reader has been approved for use with Android smartphones and tablets by the US Department of Defense. The baiMobile 3000MP is the first and only Bluetooth CAC/PIV reader to pass all NSA and DISA required Bluetooth security tests for Android devices. DISA approval of the reader is documented in the DISA Mobility Security Technical Implementation Guide recently published. In addition to the 3000MP Reader, the baiMobile solution also includes 1) middleware libraries, device drivers and APIs that are provided to developers enabling them to build smart card-enabled applications and 2) security files installed on the Android device to enforce Bluetooth security policies. The baiMobile solution permits network or client applications residing on the Android device to access the credentials stored on the smart card to perform functions such as digitally signing and decrypting emails, and authenticating to secure web sites and network servers.